Birthday party goodie bag ideas or treat bags can be a fun and creative way to hold party favors, party bag fillers and and goodies. Below are some great examples of items you can use to hold birthday party favors with a creative flare. Almost anything can be used as a goody / treat bag / goodie / loot bag. Use the birthday party theme to create goodie bags that will make the birthday party guests remember the party and how much fun they had every time they look at the loot bag. 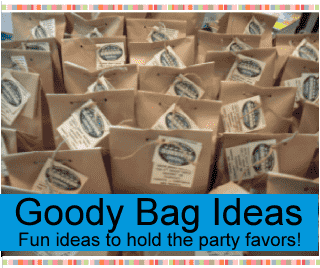 All of the 200 birthday party themes on the website also have themed goody / treat bag ideas! Here are a few wonderful birthday goodie bag ideas sent in by our readers! Thanks to all of you! Fun and creative birthday party favors to put inside the Goody / Treat bags.